I just heard that after January 2011 they will no longer administer the Italian driver's exam in English! I desperately need the theory books to study but cannot seem to locate one anywhere in Genova! ...has anyone taken the exam in English? I've heard it was a horrible translation and you're better off taking it in Italian, even if you're not fluent. I took the exam in English. In my opinion it wasn't so bad. The translation was fine to me, moreover on the same page, there were the Italian question too in a smaller font so you see both version. 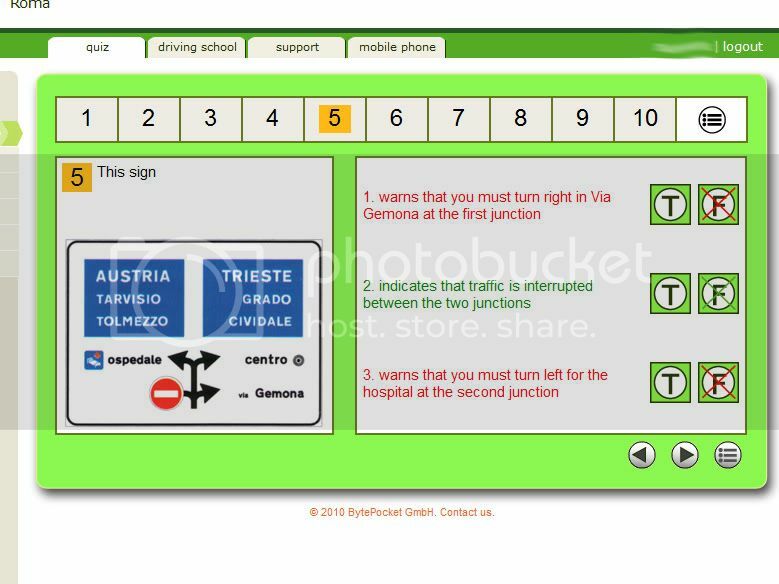 The issue could be when you go to the driving school's website for the online quizzes. Since they are seperate from the official school, they might have a very odd translation that may affect the way you answer. I've given a screenshot as an example. But, on the same page you can also switch languages back to English and Italian interchangeably to compare. I've got a question. Is the exam available in English THROUGH January 2011, or UNTIL January 2011 (i.e. through 31/12/10).